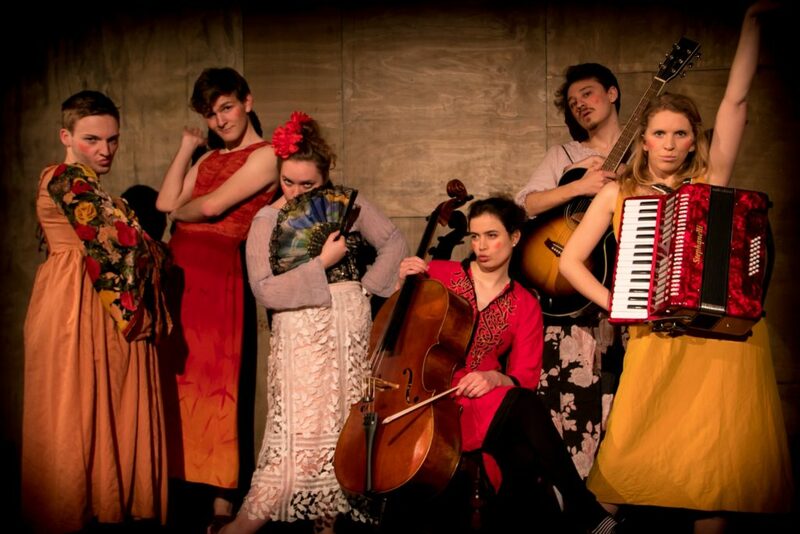 As you enter the small 60-seater basement space of the Pleasance Theatre you see a cast of five: three musicians playing Eastern European folk music on a cello, a guitar and an accordion, with two young men unaccountably wearing dresses, swaying in time to the music. Enter Madame Fanny (Kate Stokes), who’s also credited as the lead writer. She explains that it’s some time in the late 18th Century, and that she’s about to relate tales of her travelling exploits. The five stories that make up the hour-long show are chosen in random order by members of the audience, selecting items from compartments in an ornate jewellery box to trigger each tale. We’re treated to a musical version of each of the stories – a lecherous French musician, woman-hating pirates, a brain transplant surgeon, a performing monkey and a cursed Spaniard who spews milk when insulted. 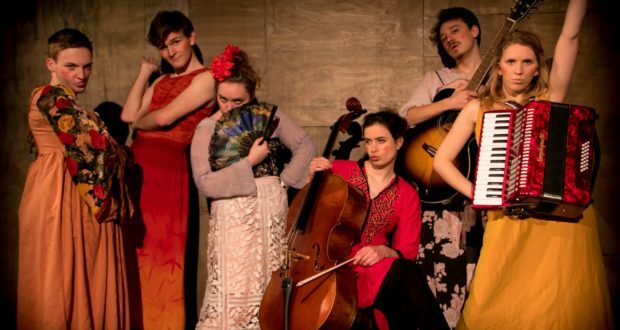 The cast of six each play multiple roles, with the exception of the musically outstanding cellist (Sophie Jackson), who sits stony-faced throughout the show with just a couple of reluctant interventions into the action. The songs are performed with gusto, with competent guitar playing from Thomas Manson; both he and Jackson are credited as co-composer. The standout performer here is Alison Cowling, who despite being a novice accordion player (those buttons under your left hand are there for a reason, you know) has real presence, an elastic range of facial expressions and a strong singing voice. The songs are fun and performed with enthusiasm, but the lyrics are utterly pedestrian and lack subtlety. “If the world is my oyster, fetch me a large plate; curiosity is my hunger, adventure is my fate” being a line that really doesn’t bear its multiple repetition. Elsewhere, weak, puerile innuendo replaces true wit. The action is well choreographed, with moments of high comedy and effective physical theatre. This is a show that would perform well to a drunken late-night audience at an Edinburgh Fringe event, but it’s not drama by any stretch of the imagination. If your idea of a fun night out is taking part in an audience singalong to My Bonnie Lies Over The Ocean then this is the show for you; for the rest of us, it feels like a school sixth form end of term review.